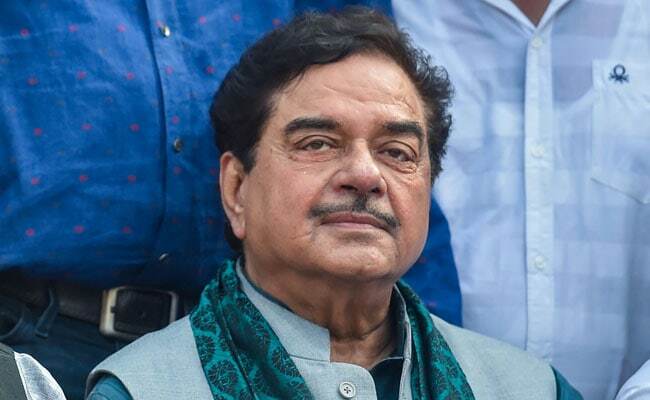 Shatrughan Sinha, BJP Rebel, Praises Rahul Gandhi's "Masterstroke"
Lok Sabha Elections 2019: Shatrughan Sinha, whose criticism of Prime Minister Narendra Modi has grown progressively sharper, did not have kind words the government's direct cash support scheme either. Lok Sabha Elections: Shatrughan Sinha didn't figure on the BJP's list of candidates from Patna Sahib. Shatrughan Sinha, the BJP's in-house critic who was snubbed by the party in the national election, praised the Congress's promise of a minimum income guarantee programme that will give up to Rs. 72,000 a year to 20 per cent of India's poorest families. Mr Sinha called it a "masterstroke" by "master of situation" Rahul Gandhi. "It's a masterstroke by the 'master of situation', @RahulGandhi - declaring #MinimumIncomeGuarantee scheme. It has rattled our people so much that some of our prominent people had to rush for a press conference, calling the whole declaration/ announcement "chhal kapat (sic)," he tweeted. Rahul Gandhi called the Nyuntam Aay Yojana (NYAY) "the final assault on poverty". Mr Sinha, whose criticism of Prime Minister Narendra Modi has grown progressively sharper, did not have kind words the government's direct cash support scheme of Rs. 6,000 a year for 12 crore poor farmers. The BJP, however, has slammed the Congress scheme, with Union Finance Minister Arun Jaitley calling it chhal-kapat (deceit) and bluff. "Congress has historically believed in political transactions in the name of removing poverty," he said. Shatrughan Sinha didn't figure on the BJP's list of candidates from Bihar's Patna Sahib, the constituency that he represents. The party is fielding Union Minister Ravi Shankar Prasad instead. Hours after the rebel BJP leader was left out by the party, he said he can "answer back in the same coin". He also accused the party of "orchestrating the departure" of veteran leader LK Advani from electoral politics. Mr Sinha, who won the 2014 election representing the BJP, had a fallout with the party leadership after he was left out of the cabinet. He has since publicly criticized the party leadership and the Prime Minister. Despite his very public attacks, the BJP stopped short of sacking him or taking any disciplinary action. Mr Sinha even attended West Bengal Chief Minister Mamata Banerjee's mega opposition rally in January. "Even if I'm part of the BJP, I speak for the people and the country first.